The Australian Energy Regulator (AER) is reviewing its current 2013 Rate of Return Guideline. The Guideline clarifies the AER’s approach to setting the regulated rate of return for electricity and gas networks. It sets out how the regulator will determine the efficient financing costs of network businesses for the purpose of setting future revenues and prices. On 12 December 2017, Energy Networks Australia lodged a response to the AER’s Issues Paper which asked a series of questions. Energy Networks Australia plans to engage with stakeholders to gain input and feedback to help inform its own considerations and positioning to feed into the AER process. This strategy is intended to complement and support the AER's guideline development process. It will also allow Energy Networks Australia to gain direct input and feedback from its stakeholders to inform industry's thinking as it develops positions on key issues and topics. Energy Networks Australia also wants to do what it can to reduce electricity prices for consumers, which means hearing from consumers is vital. The purpose of our engagement is to seek the views of consumers and other stakeholders, to help inform Energy Networks Australia’s own positions to feed into the AER’s review process, including the series of expert concurrent sessions known as “hot tubs”. 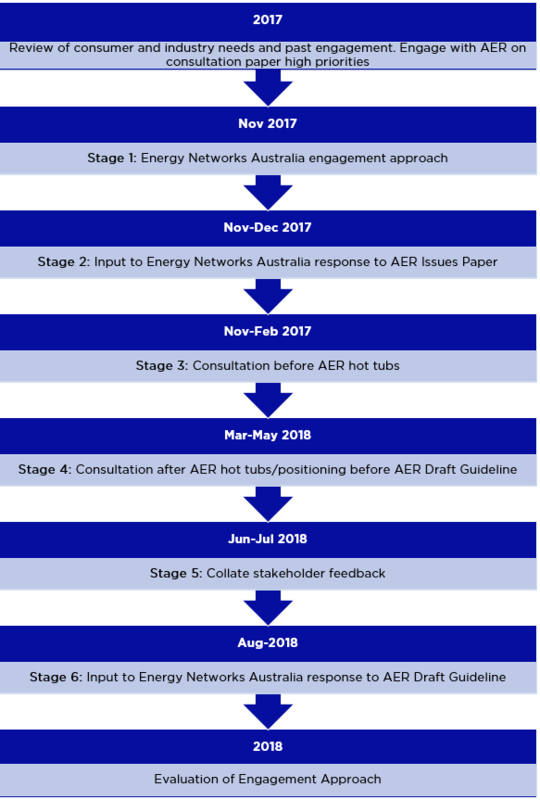 Energy Networks Australia has prepared a Rate of Return Engagement Approach document for this review, which will be updated during the AER’s review process. Early engagement with consumer groups and stakeholders has shown support for Energy Networks Australia’s engagement approach, and the need to provide information that is accessible, understandable and in plain English.